As Program Manager and Evaluation Director, Ashley Bogar leads Idaho EPSCoR efforts on data collection, analysis, and reporting for evaluation and assessment of project activities. She received her Master's degree in Psychology (with an emphasis in Human Factors) in May 2015. 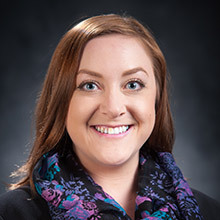 Prior to joining EPSCoR, she worked in various departments at the University of Idaho for over nine years, including laboratory and administrative settings, the College of Graduate Studies, and the Office of Sponsored Programs.